Do we need to be reminded that Christmas is coming? Of course not. Hopefully, we have survived Thanksgiving, Black Friday, Small Business Saturday, Cyber Monday and whatever else is thought up to sell merchandise. I don’t pay a lot of attention to those except to avoid them with great passion. We decided many, many years ago that we would not share Christmas presents between our families. With my two daughters living roughly 3,000 miles apart, and at that time I was wherever I happened to be in my RV, it was already expensive to send gifts through the mail and it was literally impossible to know what anyone wanted or how it would fit. Instead, every two years for a couple of decades, we more or less tossed a dart at the map, met for a week, and celebrated time together during a nicer time of year than December. 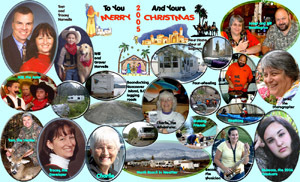 Something I started doing almost from the time I began to full-time RV was to make a montage of our family with a note on it or with it. In the beginning, we had no Internet, no Facebook, and in fact, hardly any telephone communication. It wasn’t that long ago, folks! Anyway, this was my first montage for Christmas 1987. 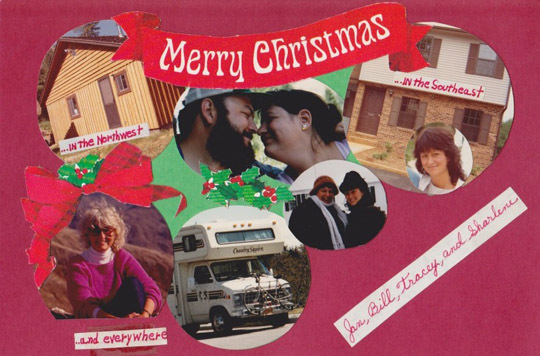 Janet and Bill were building a home in ID, Tracey was renting in VA, and I was living in my first 25’ Class C and that picture was taken in WA (Not realizing I would one day live in WA). Obviously, this was previous to son-in-law Tom, and grandchildren Becca and Will. Lots of people really hate Christmas letters so every year I put something like this at the beginning of my letter, “A fast Merry Christmas and Happy New Year to those who hate newsletters, and to those who like them, enjoy! “ That rather lets them off the “guilt” trip when my letter is crumpled and tossed into the wastebasket. I add a paragraph about what each one is doing.In the beginning, these were created with poster paper and photographs and photographed! Fast forward to later years, and they were (and are) created in Photoshop and many are sent via e-mail. The newer Photoshop programs have a way now to create the same kind of thing by just putting 10 (or whatever number) of photos together and the program itself creates a montage. That is handy but I like to “build” my montage and I cannot tell you how often I stare at each family member and laugh or cry because I miss him or her so much. Over the next few weeks, I’ll show you some more of these montages and tell you about my family memories. I hope you are making memories or remembering, as well. God Bless until next week.